Today we’re gonna learn how to assemble a mobile whiteboard by Luxor. Here you see depicted the various hardware that will be used. Position one of the long, vertical supports on a table. Take the short, horizontal support and line it up by placing the long bolt with washer through. After you’ve sufficiently tightened the bolts by hand, use the wrench that was included in the hardware pack to complete the assembly. Next, insert a small washer on the end of the caster stem. Take the caster with washer and thread it on to the bottom of the short support. Tighten the nut by hand, turning the nut clockwise while holding the caster still. Once you’ve sufficiently tightened the caster, again use the wrench included with your hardware pack to secure the nut tightly against the bottom. Once you’ve finished assembling both sides, take the lower, bottom support and position it next to one of the fully assembled supports. Insert the bolt through the hole on the vertical support and line up the bottom support by passing the bolt through. Once we have the parts lined up, take one of the large washers and locking nut, and secure it in place. When attaching the nut to the bolt, make sure to put the widest section of the nut against the washer, and the part with the rubber gasket away from the bolt head. Use the same approach to fasten the bolt to the hole at the bottom of the support as well. For use of assembly and to tighten the nuts, it’s recommended to use two wrenches. Use the same approach to fasten the bolts, washers, and nuts to the other side. Depending on the model purchased, you might have to pre-assemble the tray to the center section with the sheet metal screws provided according to the instruction sheet. Next, locate the center section that includes the tray and your spring release and locking ring. Attach the locking ring to the hole that’s been pre-drilled into the underside of the spring release. Take the center tray with the spring release that’s been attached, and line it up with the middle of the pre-built unit. Line up the holes and again use the short bolt, large washer, and locking nut to begin assembling your component. It’s recommended that you fasten the top section on one side and then the top section on the other before assembling the bolts, washers, and nuts. Depending on the model you purchase, you might have to preassemble the components of the knob according to the instruction sheet. Slide the knob through the hole on the top of the vertical support, line up the slip nut and small washer with the hole of the threaded insert that’s been pre-attached to the side of the whiteboard. Once you’ve lined up the components, turn the knob clockwise, screwing it through the assembly into the side of the whiteboard. 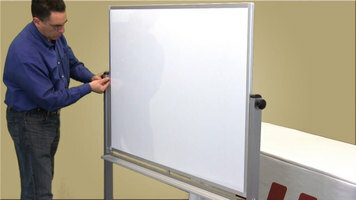 Carefully remove the plastic protective cover from the front surface of the whiteboard. Once the whiteboard’s been assembled you can test the spring release by pulling down on the ring. Your mobile whiteboard by Luxor is now ready for use. Check out this video to learn how to assemble your mobile whiteboard from Luxor! 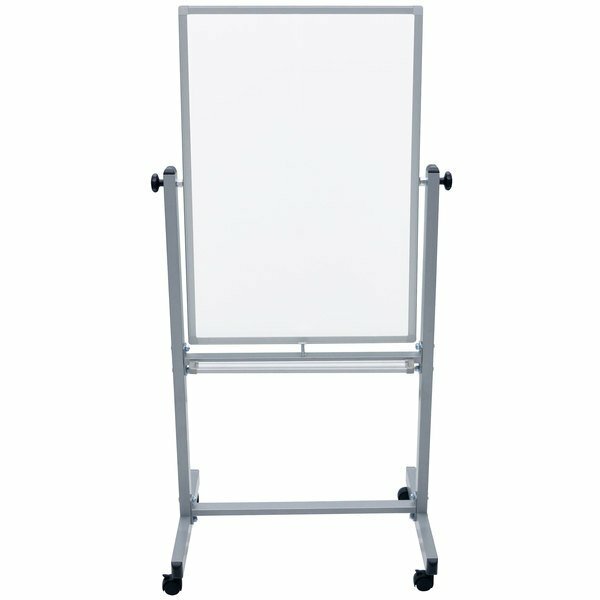 Add visual appeal to your meetings or presentations with this convenient whiteboard that you can assemble and transport. When you need to list the soup of the day or premium specials at your restaurant, don't get caught without this Luxor L270 double-sided whiteboard with aluminum frame. Its convenient, magnetic surface is made of painted steel, making it ideal for hanging a number of presentation materials or providing a large writing surface to get your message across. Thanks to the knob adjustment feature and locking brakes, you can easily flip from one side to the other and ensure that the board stays steady while you write. Plus, this board's lightweight aluminum frame and 4 casters make it easy to maneuver down hallways, into elevators, and around the room! Very high quality and easy to assemble. Looks nice on the production floor or in the office area. Luxor makes a nice quality product. We love it! This whiteboard is great! Watch the dimensions, but it rolls, it flips. Yet it is sturdy enough to draw and write on without worry. Easy to clean and the white board surface has been holding up very well. 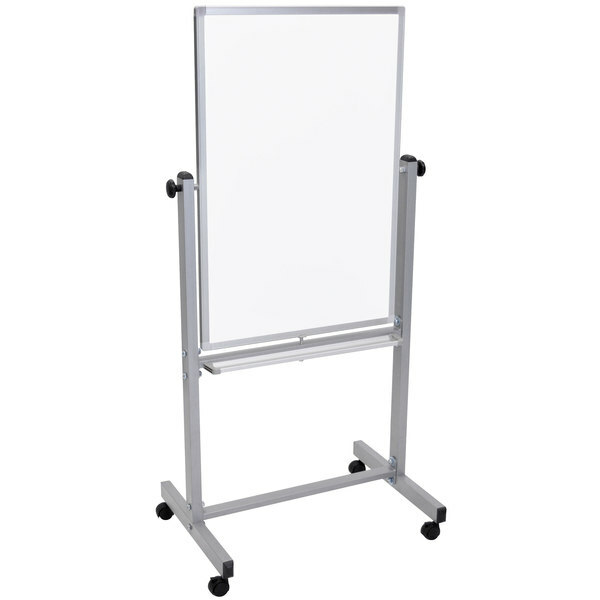 The Luxor L270 Double Sided Magnetic 24" x 36" Whiteboard with Aluminum Frame. It is great, My husband uses it for presentations when he has meatings. But they are also nice for home scooling your kids. They work great with the Wet dry markers.